Sonus Faber launches Liuto cinema speaker range | What Hi-Fi? Set to be distributed by Absolute Sounds, the range takes its name from the Italian word for 'lute', the instrument that inspired the curvaceous design, and no doubt what Sonus Faber hopes is a sweet sound. 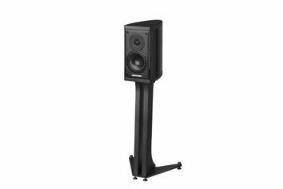 The Liuto range consists of three models: a floorstanding speaker called Tower, a compact standmount that can sit horizontally or vertically called Monitor (pictured), and a surround speaker called the Smar. All the models have custom-built drive units, including a 25mm fabric dome tweeter and 150mm polypropolene fabric cone main driver, while the Liuto Tower adds a 220mm bass driver with an aluminium/magnesium alloy cone. The Tower and Monitor speakers are finished in 'goffered black and high-gloss black piano lacquer, with black leather covering the front baffle'. The Liuto meanwhile sports wrap-around black leather, with goffered black panels at either end. By 'goffered', we understand tihs to mean ridged or frilled. Naturally Sonus Faber makes plenty of bold claims about sonic performance, boasting particularly about the speakers' 'talent for reproducing the human voice... a cornerstone of Sonus Faber's sonic tradition'. Now about those prices... While the company is eager to say these speakers 'don't cost the Earth', they are comparatively expensive. A pair of the Liuto Tower speakers will set you back £3490, the Liuto Monitors will cost £1690 per pair and the Liuto Smart is £1000. Still, look nice, don't they?